Linking tephras back to their source centre(s) in volcanic fields is crucial not only to reconstruct the eruptive history of the volcanic field but also to understand tephra dispersal patterns and thus the potential hazards posed by a future eruption. Here we present a multi-disciplinary approach to correlate distal basaltic tephra deposits from the Auckland Volcanic Field (AVF) to their source centres using proximal whole-rock geochemical signatures. In order to achieve these correlations, major and trace element tephra-derived glass compositions are compared with published and newly obtained whole-rock geochemical data for the entire field. The results show that incompatible trace element ratios (e.g. (Gd/Yb)N, (La/Yb)N, (Zr/Yb)N) vary widely across the AVF (e.g. (La/Yb)N = 5 to 40) but show a more restricted range within samples from a single volcanic centre (e.g. (La/Yb)N = 5 to 10). These ratios are also the least affected by fractional crystallisation and are therefore the most appropriate geochemical tools for correlation between tephra and whole-rock samples. 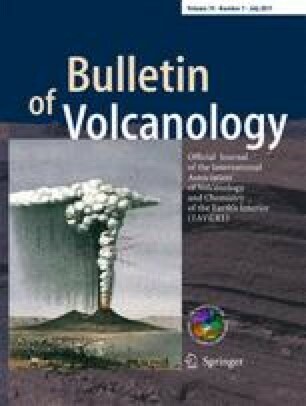 However, findings for the AVF suggest that each volcanic centre does not have a unique geochemical signature in the field as a whole, thus preventing unambiguous correlation of tephras to source centre using geochemistry alone. A number of additional criteria are therefore combined to further constrain the source centres of the distal tephras including age, eruption scale, and location (of centres, and sites where tephra were sampled). The combination of tephrostratigraphy, 40Ar/39Ar dating and morphostratigraphic constraints allow, for the first time, the relative and absolute ordering of 48 of 53 volcanic centres of the Auckland Volcanic Field to be resolved. Eruption frequencies are shown to vary between 0.13 and 1.5 eruptions/kyr and repose periods between individual eruptions vary from <0.1 to 13 kyr, with 23 of the 48 centres shown to have pre-eruptive repose periods of <1000 years. No spatial evolutionary trends are noted, although a relationship between short repose periods and closely spaced eruption locations is identified for a number of centres. In addition, no temporal–geochemical trends are noted, but a relationship between geochemical signature and eruption volume is highlighted. The online version of this article (doi: 10.1007/s00445-017-1131-y) contains supplementary material, which is available to authorized users. JLH is funded by the DEVORA (DEtermining VOlcanic Risk in Auckland) project, led by Jan Lindsay and Graham Leonard. JLH would like to thank Elaine Smid and Shaun Eaves for field assistance, Neville Hudson at the University of Auckland collections for assistance in finding pre-existing samples, and Bruce Hayward for invaluable advice on site locations for new samples. David Lowe, Monica Handler, and Stephen Blake are thanked for for valuable discussion and advice during the early stages of this manuscript. The authors also wish to thank Marcus Bursik, Siwan Davies, Kristi Wallace and James White for their thorough reviews of this manuscript.